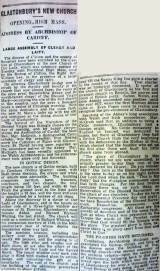 Number 1 - an account of the opening of the first church in Dec 1926 from the Central Somerset Gazette. A full typed account of the opening is printed at the side bar. Number 2 This photo is from the college magazine (1913), taken at a summer garden party at Stonyhurst, where the Revd Francis Burdett SJ (3rd from the right, talking with a student, an Austrian archduke) was teaching Philosophy, three years before his ordination. 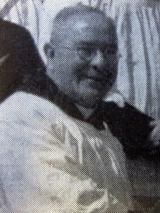 Fr Burdett was parish priest 1926 - 1928. 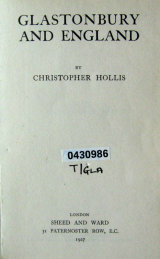 Number 3 The title page of a book of essays, by the young Christopher Hollis ( father of Crispian, later a priest of Clifton diocese, and bishop of Portsmouth), published in 1927, when he was teaching History at Stonyhurst, and dedicated to 'Fr Francis Burdett', whom he had presumably got to know at Oxford (where he was received into the Church) in the early 1920s. Here is a photo of Bishop Crispian taken in St Mary's 2016 at the Holy Door of Mercy. Number 4 The interior of the first, 'post-Dissolution', St Mary's church in Glastonbury- a converted stable- which served the newly established parish from 1926 to 1938, when it was demolished, to make way for the present shrine-church. See 'number 1' for a description of its fittings and details of the opening of the church. The statute was commissioned by Fr Burdett and carved in the Tyrol; the tabernacle still survives, as the one link with this temporary church. Number 5 A diocesan pilgrimage, from The Tor to the convent grounds for Benediction, became an annual event during in late 1920's. Benedictine monks and two Franciscan friars are leading this procession of diocesan clergy down the High Street. 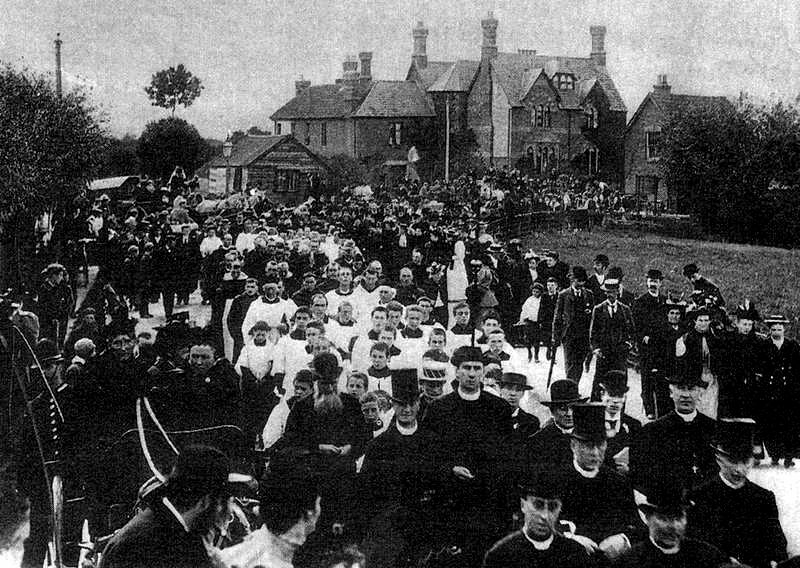 Here is a photo from the 1895 pilgrimage. Number 6 Fr Patrick O'Beirne parish priest 1928-1938. Number 7 This photograph of the 1931 pilgrimage, passing across 'Fairfield' on the lower slopes of The Tor, first appeared in 'The Universe' and was reproduced in the same Catholic weekly in recent years. Number 8 Behind the first church and convent school. Outdoors Benediction to the rear of the converted stable, presumably during a pilgrimage (monks from Downside can be seen centre left, and diocesan priests in the foreground), taken seemingly in the early 1930s. 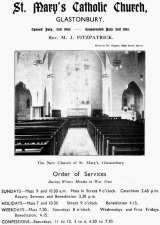 Number 9 Weekly service schedule during the incumbency of Fr O'Beirne (parish priest, 1928-38). In 1929, under his leadership, Glastonbury parishioners erected the wooden chapel at Somerton - which was in the parish (till the mid 1930s); this was replaced by the present St Dunstan's church (built on the same site) in 1965. Number 10 Photograph of two Sisters of Charity outside the convent of St Louis- with a glimpse of the 'temporary' church- taken during the period 1926-38. Number 11 Pilgrims progressing down the High Street in the 1930s, probably 1932. 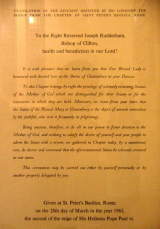 Diocesan pilgrimages did not take place during the war years, and were only recommenced in 1950. 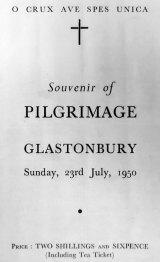 Number 12 The cover of a pastoral letter dated 1933, from the Bishop of Clifton (Rt Revd, William Lee) outlining his proposal, and appealing for donations, to build 'a pilgrimage church',to mark the 400th anniversary of the Glastonbury martyrdoms of 1539. 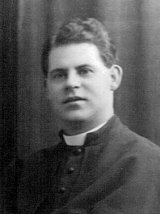 Number 13 Fr (later Canon) Michael Fitzpatrick was our young, parish priest (1938-44) who was told by Bishop Lee: "I have some work for you. I want you to go to Glastonbury and build a Church. ", a mission he successfully accomplished, the present St Mary's being consecrated in July 1941, with sufficient money having been raised through his appeals around the diocese and well beyond, to leave the parish without a debt, despite the fact it was wartime, and the building cost £40,000 - a miracle, for which Fr Fitz gave the credit to St Joseph, under whose patronage he had placed the project. Number 14 A photo of the first statue of Our Lady. When a new statue was carved in 1955 - this statue was placed in the convent chapel. When the convent closed in 1984 - it was taken to the Richmond convent. Number 15 Elliott family. 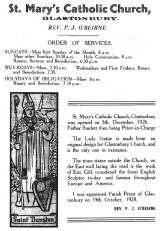 The poster advertises the stone laying of the present church, by Bishop Lee, with sermon and Benediction, in July 1939 (just over a month before the outbreak of the 2nd World War- in which Mr Elliott lost his life, in a Japanese POW camp). 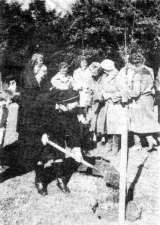 Number 16 laying of foundation stone of present church. Bishop Lee (kneeling) with the abbot of Prinknash (Dom Wilfred Upston) to the right, at the blessing ceremony within the wooden frame of the new 'pilgrimage' church ("the apple of his eye", it was said). Work began on 6 March 1939, and the foundation stone ceremony took place that July. Number 18 photo showing Dom Ethelbert Horne OSB - a monk of Downside, and a noted archaeologist who had supervised excavations within the abbey ruins, and who in recognition was created titular abbot of Glastonbury (by the English Benedictine Confederation) as well President of the Glastonbury Antiquarian Society; seen here in old age, c.1941, on one of his visits to the town. Number 19 A view of the interior as it was from 1940. 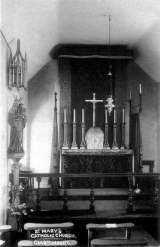 Sadly the High Altar was removed following the Second Vatican Council, when the present free-standing one took its place, in the centre of the sanctuary (c.1970), allowing 'versus populo' celebration of The Mass. Also shows the services during the war years. Number 20 The sanctuary stained glass donated by Mrs Mostyn in memory of her husband Charles. She also gave many generous money donations to the church. She lived in Pennard House, East Pennard and also had the village hall at West Pennard built. Later she moved to Glastonbury and lived in "Tor Down" Ashwell Lane. 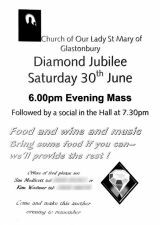 She was a familiar figure around Glastonbury and West Pennard. Her funeral in St Mary's was conducted by her brother-in-law, Fr Mostyn. Her obituary stated that "Glastonbury is the poorer for her passing". She is buried in West Pennard cemetery. 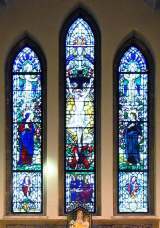 The window was designed and built by Hardman of Birmingham. In the centre is the Crucifixion with Mary Magdalene at the feet of Jesus. On the left is Our Lady, Mary and on the right is St John, a disciple of Jesus. 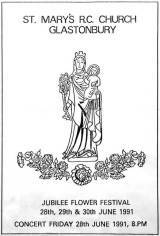 Below Our Lady is St Dunstan and the coat of arms of the Clifton Diocese. Below St John is Richard Whiting and the coat of arms of the Mostyn family. The scene is the signing of the First Privilege (grant) in 704 by Ine, King of Wessex, in the presence of St Aldhelm, Abbot of Malmesbury and first Bishop of Sherborne. Number 21 1945 wedding of Doug Pattison and Winnie Wheeler - one of a number of weddings that followed the end of the Second World war. Fr (later Canon) William Ryan was parish priest 1944-1948 is shown here in centre of photo. With the increasing number of Catholics in the parish, he was assisted by two curates(!) also shown in this photo Fr McGrath and Fr White, and began to raise funds for the building of a daughter church, on a site acquired in Street. Number 22 This plaque, now on the sanctuary wall, close to the hanging tabernacle-light, was originally in the (south) side-chapel, where a light was presented at 'a diocesan pilgrimage on February 2nd, 1949...to burn before the [old] statue of Our Lady', which at that time stood there. See number 18 for a photo of Dom Ethelbert Horne. Number 25 The first in the run of subsequently annual Diocesan Pilgrimage, souvenir-programmes. 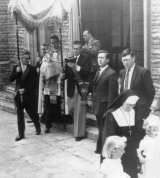 Number 26 A First Communion procession, 1952, from the Convent school, led by Tony Wheeler. Read his memories of parish life. 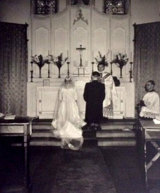 Number 27 1952 wedding of George and Irene Hann with Fr Joseph Sheehan (parish priest 1948 - 1952) in St Mary's church. Number 28 Appeal letter about treating fungus in the church. Number 29 Pilgrimage procession, after having assembled on the slopes of Glastonbury Tor, they are shown here coming down Bove Town, then down the High Street and into the Convent field for Mass. 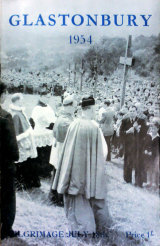 Number 30 pilgrimage - photo taken 1953 - includes Damien and Mostyn Norton, Bernard and Kevin Squire and Brian Elliott. Does anyone recognize any more of these young servers please? 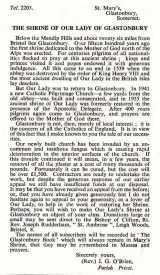 Number 31 From 1953 - the proposed Shrine of Our Lady of Glastonbury which was to be built behind the present church. 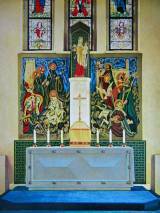 Read the letter from the Knights of St Columba, proposing the new Shrine to the Bishop. 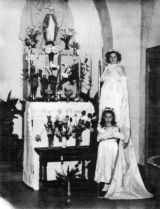 Number 34 1954 May crowning in church - a temporary altar set up in front of the (curtained) Sacred Heart chapel. Irene Donnelly crowned the statue, and Veronica Weeks (now Brunt) was cushion-bearer- chosen (as Veronica recollects) 'by names being picked out of a hat by Sr Aimee', headmistress of the convent school. Number 35 1955 Blessing of the new statue of St Mary, 'Our Lady of Glastonbury' by the Apostolic Delegate, Archbishop Gerald O'Hara during the pilgrimage. The Pilgrimage procession ended in the convent grounds where an altar was erected. 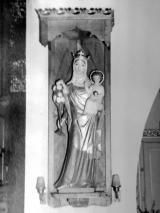 Number 36 - the current statue of St Mary in its original location in the present church. 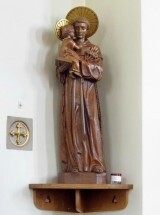 When this new statue was in the church, the first statue of St Mary was in the convent chapel. When the convent closed in 1984 the statue was taken to the Sister's mother house in Richmond, Surrey. Number 37 Knights of St Columba carrying one of the wooden crosses in the annual pilgrimage. This photo was taken along Magdalene Street opposite the church. Number 38 'Pax Lea', Orchard Road, was the house (shown here) where as the convent annals record, Sr Mary Veronica and Sr Rita began Catechism Classes on Sunday afternoons, in October 1960, helped by Miss Myra Gifford (one of Fr Chauvat's three converts, in 1919/20)- "a true apostle". These seemingly continued for some years- though it would perhaps be misleading to give the impression that they continued beyond the 1960s. 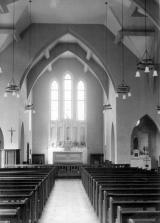 Read the story of a parishioner's memories of St Marys. Number 39 line up of eminent ecclesiastics with Archbishop Heenan - visiting from Liverpool (shortly before he was appointed to Westminster, and created a cardinal). We think it is Canon Hackett (PP of Wells) second from the right, between Bishop Rudderham and Fr O'Brien (PP of Glastonbury) - photo taken c1962 as shows the first school hall in the background. 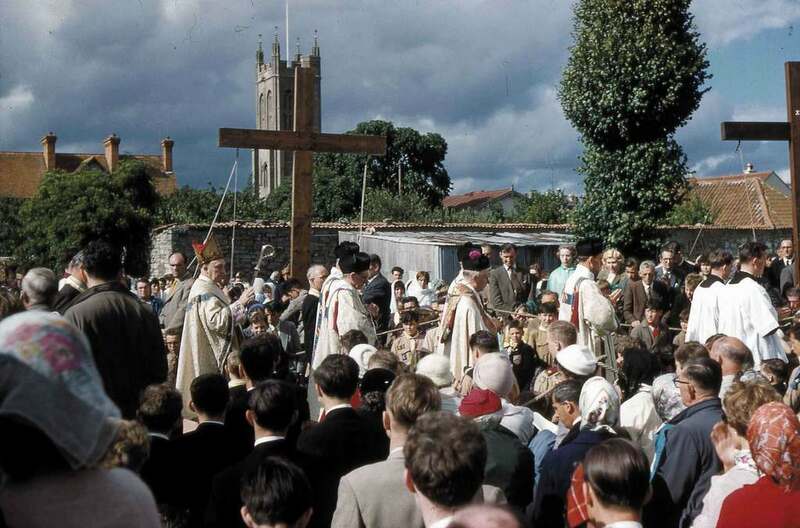 Number 40 - monstrance carried by Fr Sean Mc Namara (PP 1962-7); the canopy bearers were Doug Pattison (front left) and George Hann (front right) with Tony Wheeler (back left) and Mr Thompson (back right). Bill English and Jack Keers , with Sister (?) following up the procession of school-girls scattering rose petals. Number 41 Christmas bazaar -mid 1960s? with Mr Thompson and audience, looking at a treasure island stall. The church Christmas bazaar was an annual fund raising event held in the convent school hall. Probably a photo in the local newspaper. Number 42 Seemingly a joint Confirmation with Wells as Fr Lee (PP of Wells 1962-9)) is shown to the left, with Fr McNamara (PP Glastonbury 1962-7) to the right. Photo taken 1964. Number 43 A translation of the rescript received by his Lordship the Bishop from the Chapter of Saint Pater's Basilica in Rome. 1965. 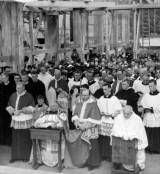 Number 44 Crowning of the new statue of St Mary July 1965 in the Abbey grounds with Fr Sean McNamara (pp1962-67) assisting the Apostolic Delegate (Archbishop Cardinale), at a Pontifical Mass in the abbey grounds- the first time the latter had been offered there since the Dissolution, and the first diocesan pilgrimage to have culminated on that 'holiest of erthe'. The pilgrimage was attended by over 20,000 people. It took place in the grounds of the Abbey Ruins (the first time held there for 400 years). The Pilgrimage procession started in the Convent field and was 2 miles long, taking over an hour to pass through the Abbey gates. During the mass in the Abbey, the Apostolic Delegate Archbishop Igino Cardinale, placed a new diadem on the Statue of St Mary. This diadem had been made from melted down gold jewellery donated by the parishioners, and was carried on a cushion in the procession. Mass was said by the Rt. Rev. Joseph Rudderham, Bishop of Clifton. Number 45 Parishioners enjoy lunch in the convent hall in 1965. Please can viewers identify and name faces here. 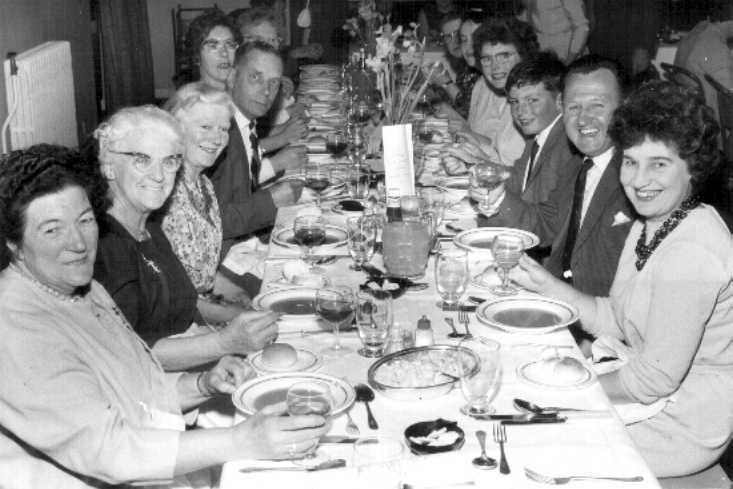 We already know a few: eg to the right of the central table: from the foreground working backwards: Mary (nee Gifford, who died, tragically young, in 2015), her mother, Joan (still with us, aged 97! ); Molly Weeks (now departed); her daughter Veronica (now Brunt); Mrs & Mr Coffey. 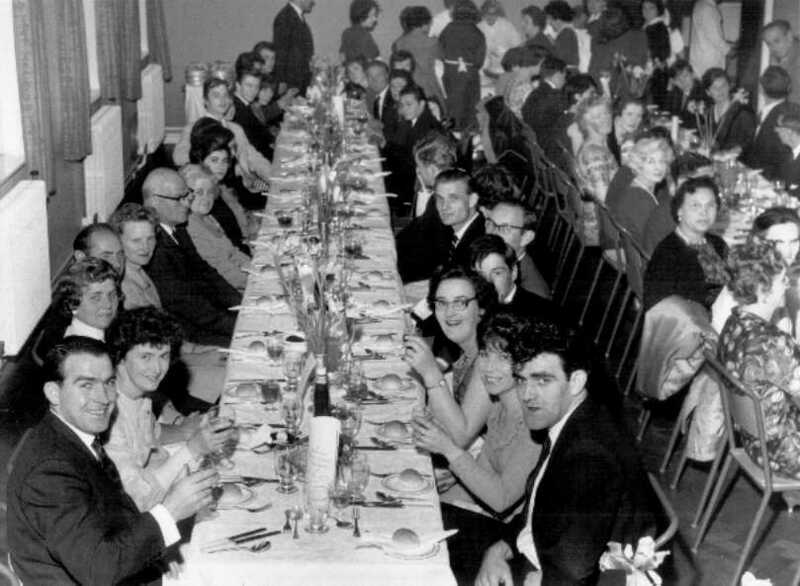 Photo 2 includes Jim and Jean Malone, Mrs. Antonello, Noel Malone and wife, Nan Sibley and Ken, Tony Sibley, George Hann, Mr & Mrs Campbell, Mr & Mrs McKay, Mrs Hinde, John Say. Photo 3 includes Peggy and John Dixon, Mr & Mrs Thompson, Mrs Donelly and Mr Parsons. 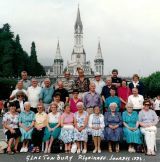 Number 48 A photo of the Sisters of St Louis who lived in the convent in Glastonbury. The photo was taken in the rose garden of Somerset House. Number 49 - 1971 confirmation group with Fr O'Connor and Bishop Mervyn taken in the playground of the convent school. Number 50 nativity play by the pupils of St Louis convent during the 1970's. 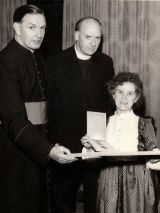 Number 51 Theresa Wheeler receiving Bene Merenti medal in 1973 from the Bishop of Clifton Joseph Rudderham and Fr O'Connor. 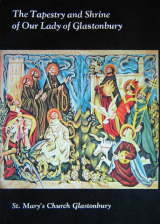 Number 52 A booklet produced by Fr John O'Connor all about the tapestry. Number 53 Confirmation group in 1977. Number 54 Cardinal Basil Hume at 1979 pilgrimage. This is in the field that belonged to St Louis convent school. Number 56. 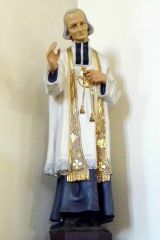 Statue of St Anthony of Padua - presented to St Mary's church in 1965 by the local Italian community. Every year, on St Anthony's feast day in June, a special mass is held in St Mary's with a procession of the statue. 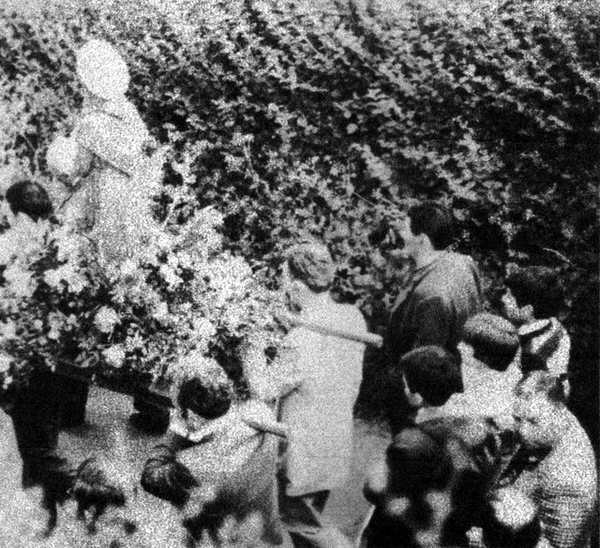 Here is an old photo showing the Statue being carried in a pilgrimage procession. Number 57 farewell presentation to Fr O'Connor in 1982. Fr O'Connor was parish priest 1968- 1982. Number 58 Lourdes grotto in convent grounds. When was this constructed, we wonder? It was presumably demolished after the Convent was sold (1983-4), and the spot where it stood is now beneath Morrison's 'superstore'- 'holy ground'- as is the site of the outdoor pilgrimage-altar. Number 59 Fr Nicholas Tranter's first mass - he was parish priest 1982 - 1984. Number 60 confirmation with Fr Paul Sankey in 1984. Fr Paul was parish priest 1984 - 1999. Number 61 1984 pilgrimage procession passing St Mary's church, having processed from the lower slopes of Tor hill and finishing with Mass in the Abbey Ruins - for the first time since 1967. Number 62 painting of Blessed Richard Whiting (last abbot of Glastonbury, martyred 1539) by Tony Wheeler in 1957. It is over 4 feet in height. 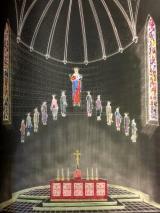 It was one of a series of 4 or 5 that he proposed – to occupy the niches in the stone reredos, behind the old high altar ( see picture 23)- but this scheme was not adopted. 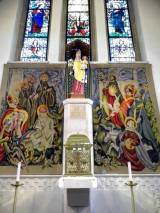 The painting was subsequently hung outside the Convent chapel, and after its closure (in 1984) placed in the church, where it is now displayed in the north ‘transept’. Number 63 Sister Francis Teresa planting a Maple tree in the Abbey ruins, opposite the former convent, in memory of the convent and Sisters of St Louis in 1985. The convent closed in 1984 after 59 years. Fr Sankey blessed the tree, past pupils and parents were also present. 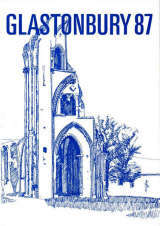 Number 64 - pilgrimage programme from 1987. Number 65 - pilgrimage programme from 1988. Number 66 - pilgrimage programme from 1989. Number 67 - Pilgrimage with Fr Paul Sankey (PP) and the abbot of Prinknash (Dom Aldhelm Cameron-Brown) preceding Bishop Mervyn; passing the Abbey (former tithe) barn. 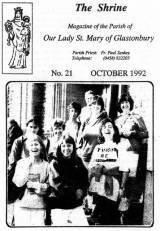 Number 69 The choir in 1992 doing a sponsored walk from St Mary's to Downside Abbey, to raise money for restoration of the church organ. Number 71 The building of the church hall. Number 72 Tony Wheeler and Bridget Smith were awarded Bene Merenti medals in 1998, during the annual pilgrimage in the Abbey grounds. This photo was taken in St Mary's church after the pilgrimage. 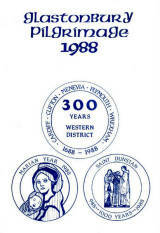 Number 75 2001 - programme of the evening Mass and social to mark the Diamond Jubilee celebration of the present church. This was the main celebration, for this 'jubilee' of its consecration. 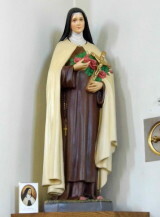 Number 76 statue of St Therese of Lisieux, gifted by Geoffrey (see No 89) and Pat Ashe, in 2002, in memory of his first wife, Irene (who was buried, in 1990, from St Mary’s, where she had sung in the choir for many years). She had a special devotion to ‘The Little Flower’ who worked a number of miracles in her and Geoffrey’s 40 years of married life, during which they raised 5 children, including Brendan, a musician, who was an organist here, in the early 1990s. 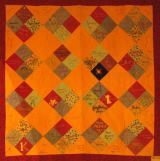 Number 77 quilt - a project proposed by Fr Kevin, and executed by Sue Oxley and Angelina Costanza, with a team. This records the names of individual parishioners or families, with their chosen verse from Scripture. It hung in the left side-chapel until Easter 2017. Read the story of the Quilt. Number 78 Youth 2000 meeting. For some years in the first decade of the new millennium, the parish hosted this weekend gathering, of prayer and praise, for young Catholics, during the autumn half-term. It was co-ordinated by parishioner (and CTS author) David Baldwin. 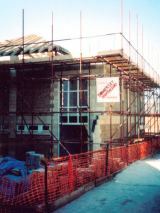 Number 79 - 2005 restoration of the Statue of Our Lady. The restoration work was carried out by David Orchard - seen in this photo with Fr Kevin. Number 80. 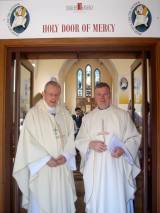 Nigel Lynch had served as MC for a decade, as well as editing the parish's 'home-produced' magazine 'The Shrine' , that he and Fr Paul Sankey had launched in the 1990. The first issue of 'The Shrine' was at the end of 1990 (December?- unfortunately there isn't a copy in the parish archives for this to be checked); No 2 was published in January 1991, at the beginning of the church's 'Golden Jubilee' year. Number 81 - 2007 Joint celebration service in the Abbey Ruins - marking the centenary of the abbey estate passing into the care of a Church of England trust, following its purchase by an Anglican benefactor in 1907. Note Fr Kevin Knox-Lecky (in biretta), flanked by URC ministers ( Eve Ridout and Tim Richards) in the ecumenical procession (led by servers from Our Lady's Shrine and St John's) plus quondam Town Crier, Graham Coles (crucifer, from St John's). 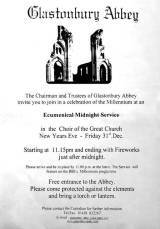 The incense had been blessed by the Bishop of Bath and Wells, who presided and preached. Number 82 Statue of St John Vianney brought from Ars (where it was crafted) by parishioner Bill Furness (who also co-ordinated the church window-replacement project during that decade). It replaced the plaster statue that had belonged to Fr J O'Brien, and that was tragically dropped (and smashed) during cleaning. Number 83 This shows the tabernacle (our link with the 'stable church' for which it was first acquired) restored to the sanctuary, from its position in the Sacred Heart chapel (right transept), after being located there for four decades, by Fr Kevin in 2009. Number 84 view of church and hall towards Cavendish Lodge, taken from the former convent building, during its conversion into separate 'town houses'. Wearyall Hill can be seen in the background. Number 85. 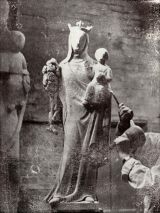 In 2011 the Burdett Madonna statue was brought back to Glastonbury and is on display in the Abbey museum. The story of the Burdett Madonna can be found on the side bar. Number 86 Fr Kevin's farewell party in 2012. After 13 very happy years at St Mary's, Fr Kevin was transferred to a parish in Bath. 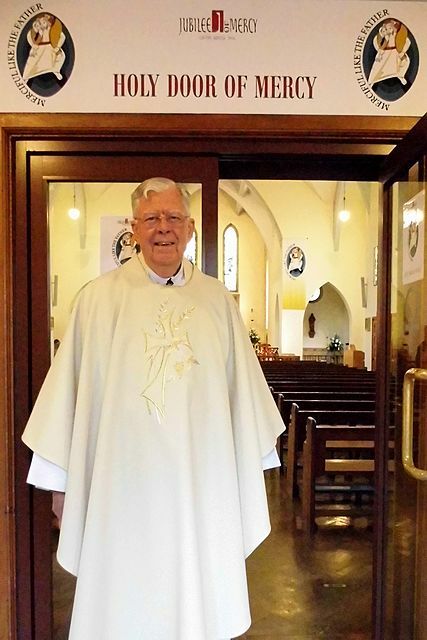 Sadly Fr Kevin died in October 2014. His requiem mass was held in a full St Mary's church. There is a bird bath in the parish garden in memory of Fr Kevin. Number 87 St Mary’s ‘music ministry’ in Christmas attire, including Ann Parsons (choir director) and organists, Sr Elizabeth Rees and Dr Pat Ashe. Members of the choir also perform locally, on occasions, as ‘St Mary’s Singers’, the majority of whom (according to their programme notes) ‘first came together in the early 1980s...principally to sing motets and plain-chant at Sunday sung Mass.’ Sundays’. See No 69 for an earlier photograph (with organist Brendan Ashe, in the background). Number 88 some of the flower arrangers of St Mary's church. Number 89 William Blake society meeting 2015. Distinguished author, and long-time parishioner, Geoffrey Ashe addressing the gathering. 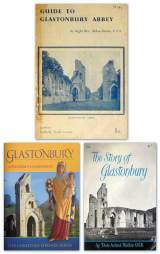 Geoffrey, who was born in 1923 and moved to Glastonbury in 1974, has 26 published books to his credit- including ‘Vision of Albion’ (a re-issue of which was being ‘launched’ on this occasion) and most notably his classic ‘King Arthur’s Avalon’ (1957), which was consulted by the designer of the tapestry (No 46) as ‘a guide to the characters’ depicted there, and appeared in a new edition in 2007. In his ‘Avalonian Quest’ (1982, p. 108 ) he recorded that the Rev. 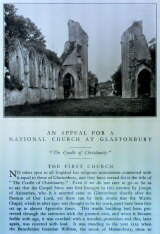 L.S.Lewis, Glastonbury’s vicar at that (‘un-ecumenical)’ time, described the ‘stable- church’, opened in 1926 ( No 1 etc. ), as the “hideous little chapel of the Italian mission”! Number 91 The Easter sepulchre and ‘garden’ - re-located (from the left side-chapel) to the sanctuary, for the first time in 2017. Joe Keers - a ‘pillar’ of the parish community, for decades and who was largely responsible for facilitating this- passed away a few hours later, shortly before the Paschal Vigil (RIP). Number 92 In Sept 2018 the three Icons were presented to St Mary's church. Those present included Bishop Declan, Greek Orthodox Archbishop Gregorios Theocharous of Thyateira and Great Britain, Fr Bede Rowe and Katerina Karoussos. They are Virgin Mary, Christ the Life Giver and St John the Theologian and Prochorus. Given as a gift by the Karoussos Foundation to Glastonbury town which is twinned with the Holy Isle of Patmos. It was arranged by Katerina. They were painted by Iannis Karoussos, who died in 2013. He was an iconographer of world importance, and is well known for his monumental fresco works in the Church of San Theodoro in Palatino in Rome. On hearing that the Isle of Patmos, which had always been very dear to her father, was twinned with Glastonbury, Katerina visited Glastonbury to offer three of his award winning icons to St Mary's church, in honour of her father and his vision of unity. The specially made wooden case which houses the three Icons was made by Paul Rendell of Glastonbury. The beautiful case is made from oak and 6,500 year old bog oak from Avalon marshes.